Back row: Tessa, Charlie, Hannah, Lynn, Yuwei, Katie, Humaira, Fran, Aimée, Eleanor. Front row: Becca, Beth, Lizzy, Louise, Lizzie, Helena. Back row: Christiane, Tessa, Leah, Fran, Katie, Charlie, Yuwei, Aimée, Lynn, Humaira. Front row: Lizzie, Carla, Becca, Hannah, Tasha, May. 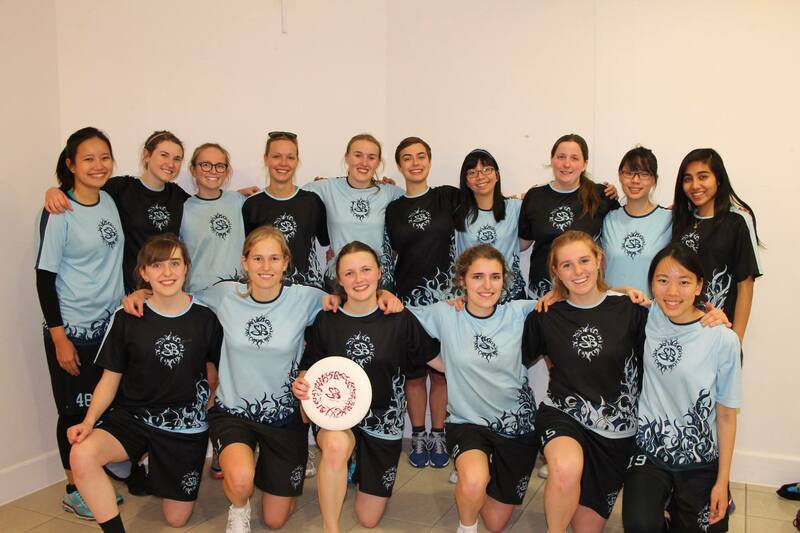 For the second year running, Cambridge took two teams to EUWIR. The first team came 7th and the second team finished 20th. We'd like to thank Eleanor for coming along on the Saturday to sideline and for coaching us. We'd also like to thank our DCU procrastisideline, Kau and Joey. Cambridge 1 started out with a match against Oxford Brookes, winning 8-0 despite trying to score a point in the wrong end zone. We played a lot of 3-2 offence and tight man defence, looking to tighten up both in preparation for pool matchs later in the day. Humaira's fantastic footwork led to several scores and Aimée got a hand block. The second match for Cambridge 1 was against KCL 2. We used this match to try out a few different options, playing ISO as well as 3-2 on offence. There was a great score from Helena and Humaira got several important D's, including a few near the endzone. The final score was 12-2 to Cambridge. Our third match was against UEA 1 and we knew it would be a tight match - UEA were seeded just below us in our pool. They got off to a better start than us and went up 2 points, but Cambridge made a fantastic 5-point-streak comeback. Tessa scored lots in a really intense match which Cambridge eventually won 5-3. 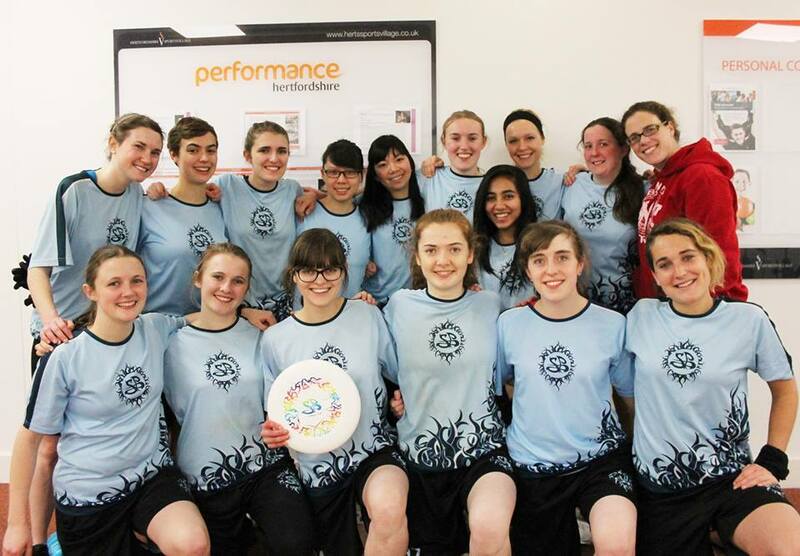 We then played Imperial 2 (shoutout to Imperial for bringing 2 teams to regionals for the first time!). Charlie scored a callahan and Fran got a fantastic D. Cambridge 1's offence was flowing really nicely and the final score was 9-1 to us. The final match for Cambridge 1 on the Saturday was an incredibly tough match against Sussex 1. Although we'd planned a strategy to shut down their ISO play, it didn't work out for us and we ended up losing 4-7, bringing it back slightly at the end of the match. Our first match on the Sunday was a crossover against Sussex 2. Having played Sussex 1 yesterday, we knew it'd be an intense match and went into it determined to win. New addition Tasha fitted perfectly into the team, scoring a point early on in the match. Our offence was flowing well, Tessa scored lots and there was a fantastic hammer from Fran to Becca for the final point. The score was 13-0. Next up was a well-spirited match against KCL 1. As the Cambridge 1 and KCL 1 mixed teams had played each other at regionals, we knew they would be a hard team to play against. We didn't manage to shut down the up-the-line cuts in their incredibly tight ISO play so although we ran hard, the final score was 3-12 to Kings. Cambridge 1's third match was against Chichester, who played a zone. Although Charlie cut through their zone several times and there was a great up-the-line connection between Fran and Tessa, we didn't manage to shut down their zone properly and the final score was 8-3 to Chichester. Due to an injury on pitch 2, the final matches on Sunday had to be rescheduled and moved around the two pitches, with priority being given to the matches that would decide Nationals qualification. However, Cambridge 1 managed to play the 7-8 against Surrey (with about 5 minutes notice!). We were determined to win our final match of the tournament, and although Surrey played a zone collapsing to a wall, we managed to work past this, winning 8-1. The spirit in this match was fantastic and it was a great end to the tournament. MSP was Aimée, best offence went to Tessa, best defence went to Fran and MVP was Charlie. On Friday evening, Cambridge 2's captain Yuwei sprained her ankle and was unfortunately unable to play for the weekend. However, she did a fantastic job captaining off-pitch and sidelining for both the second team and the first team, ably assisted by Katie who stepped in at the last minute to run warm-ups and captain on pitch. Cambridge 2's first match was against UCL 1, and they were expecting a tough match, UCL having qualified for nationals at EUWIR 2014. However, UCL had clearly lost several key players since last year and the seconds gave them a tough match. At one point, the scoreline was 1-all with the final score 2-4 to Cambridge 2. There were amazing scores from both Beth and Louise with Lizzy's scoobers consistently getting past the UCL defence. Katie and Hannah had a great connection, there were lots of break throws and fantastic movement + flow from everyone on the second team. Next up was a match against Kent 1. Although the final score was 2-8 to Cambridge, the scoreline was relatively even at the start of the match with a great score from Louise to equalise. Cambridge 2 used their long options a lot in an attempt to get past Kent's tough zone. There were also a lot of good throws (including scoobers!) over the top of the zone. The third match was against Essex 1, who played another zone for the team to work around. This was a fantastic performance from Cambridge 2 who were 2-1 up at one point! The final score was 4-3 to Essex. Lynn had some fantastic deep cuts, Lizzy consistently got discs over the top of the Essex zone and Katie made a phenomenal run through D to save a score. Hannah scored twice and there was a huck from Lizzy to Beth at the end for the third point. Louise did a fantastic job of finding all the holes in the Essex zone. Cambridge 2 then had a match against Portsmouth 1. Although they were down 1-9 at one point, the final score was 3-11 to Cambridge, with the last 4 points traded between the two teams. Beth saved a macked D for the final score! The Cambridge 2 team changed almost completely on Sunday, with only 3 of the players from Saturday returning. Their first match on Sunday was against Hertfordshire. Despite solid defence and multiple run through D's from the Cambridge team, the final score was 12-0 to Hertfordshire. Next up was a match against KCL 2. This was a really even match with Cambridge eventually winning 4-2! The final point was a deep shot from Katie to Carla. The third match of the day was against Oxford 2, giving both teams a chance to practice before Varsity next term. Although Oxford 2 won the match 10-3, Cambridge 2 played really well with some great handler cuts from Leah. As expected (they were playing Oxford! ), the match was really well spirited. Unfortunately the second team's final match was one of the matches that had to be cut short as a result of the injury on pitch 2. Thanks to the TD for making sure that this match was still played! Although the final score was 2-0 to Imperial, Cambridge played really well with several close scores. As the second team changed between the first and the second day, they elected MVP, MIP and MSP for both days, although Katie was voted MSP on both Saturday and Sunday! Saturday's MVP was Louise and MIP was Beth. Sunday's MVP was Leah and MIP was Hannah.